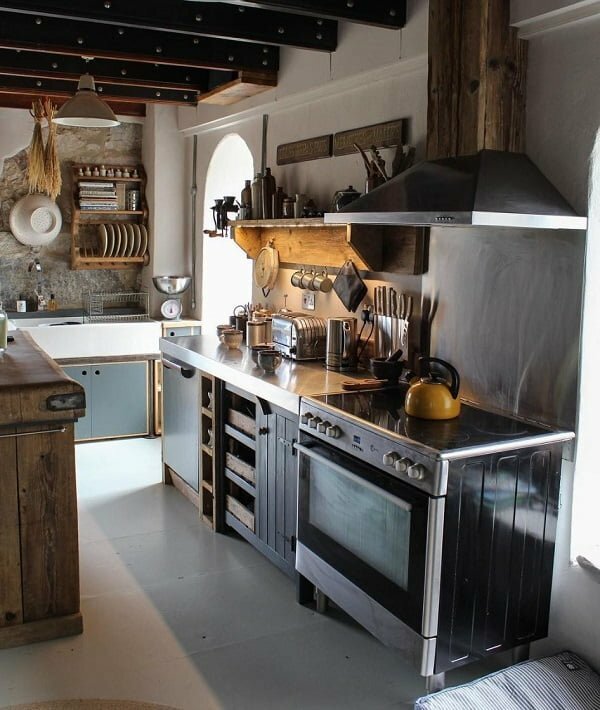 Looking for the best rustic kitchen cabinet ideas? Here are some of the most beautiful and creative ideas that will help you revamp your kitchen. Updated for 2019. If you find modern kitchen designs boring you need to go for a different style. Farmhouse and rustic have been all the rage in these past years. It’s not because these trends offer a certain look (which they do) but because there’s a whole philosophy behind them. Rustic is all about creating a cozy close-to-earth look. Often it also means being eco-weary and reusing materials. Since the best way to revamp your kitchen is changing the cabinets, that where you can start implementing the rustic look. There are many ways to get rustic kitchen cabinets, from buying them, to building them yourself. Sometimes a new coat of paint is all it takes. 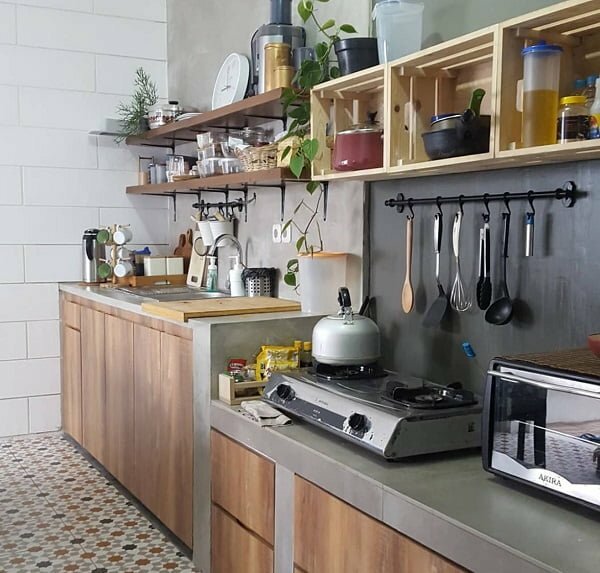 So check out our selection of the most original rustic kitchen cabinets and get inspired for a new makeover. These kitchen cabinets are custom made from barn wood and feature the ultimate rustic farmhouse style. The hardwood floors and wood planked walls make a complete rustic wooden decor. While this all-in wood decor is not for everyone, it works well in cabin decor like this. 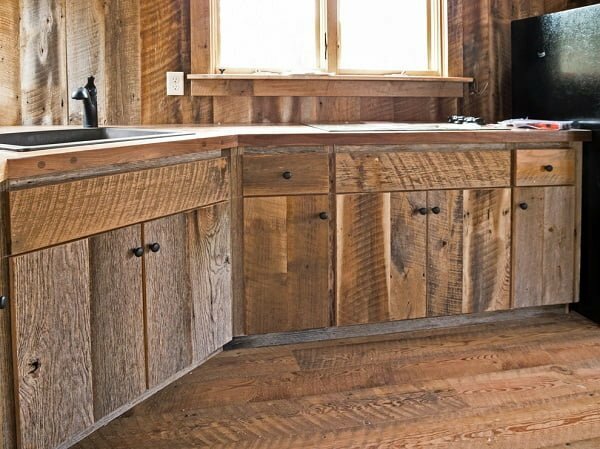 If you’re looking just for kitchen cabinets, this idea for using barn wood will work well if you want a rustic accent. 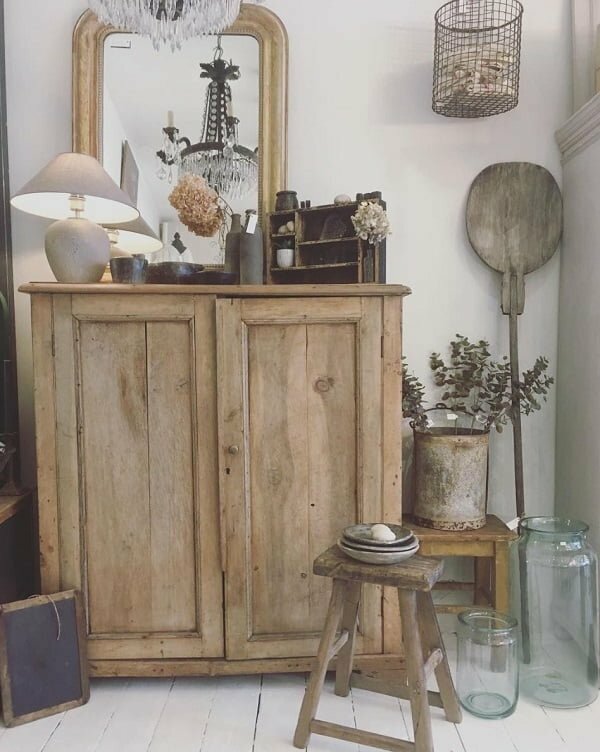 Solid wood always works perfectly in rustic decor. In this case, the hardwood floors and accent ceiling wood beams are complemented with solid wood kitchen cabinets in a natural stain. This kind of cabinet design can be used even in modern kitchen design. Wood as a material can be used together with neutral colors to get a warm decor accent. 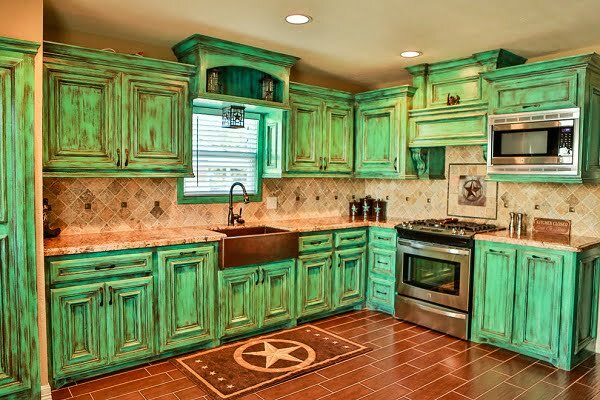 Weathered green paint look comes alive in this rustic kitchen. The traditional floor and wall treatment are transformed with this look. Copper accents and farmhouse sink bring it all together. 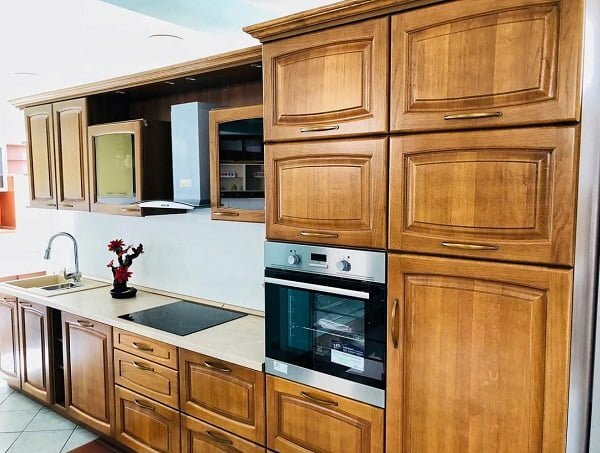 What can be learned from this kitchen design? Weathered paint all the way! 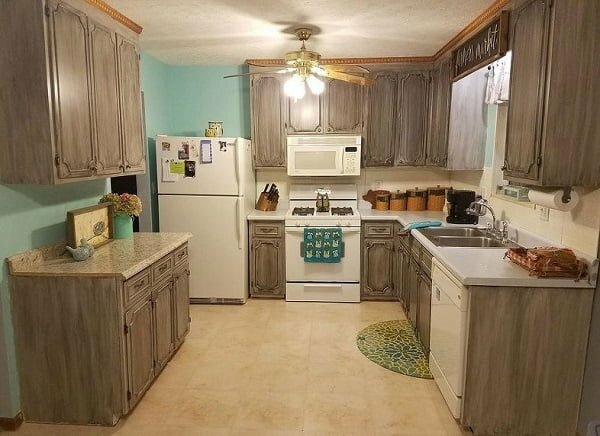 If you’re looking to revamp your kitchen in a rustic style, all you need is a new coat of paint for the cabinets! This design is not for everyone as it looks very raw. That’s achieved with the use of transparent stain keeping the natural wood color. But the earthly accents can have a significant impact in any kitchen decor. What’s so special about this design? Raw craftsmanship works! 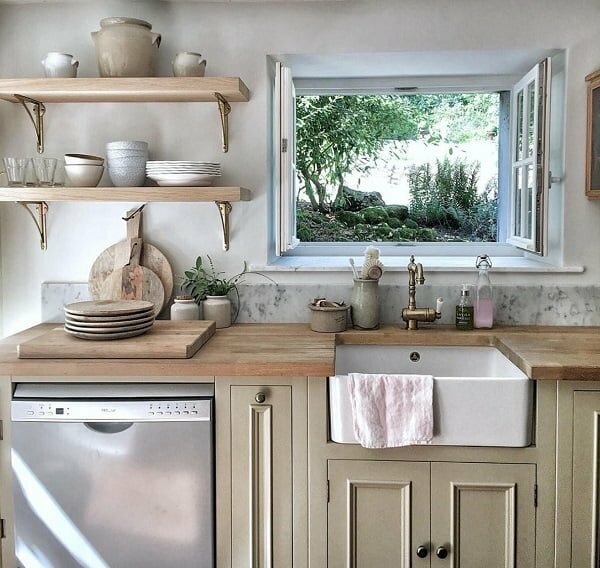 These rustic shaker cabinets are a sure hit on Pinterest and Instagram. They’d make a great conversation piece with your guests too. Here’s another excellent example of natural woodworking so well with green accents. In this case, it’s the appliances and open cabinet backdrops in the shade of green. What is there to learn from this design? You can use unexpected accents in rustic decor through inspiration or trial and error. Where else than a cabin decor you’ll find such a complete rustic style. The vintage weathered look of the kitchen cabinets makes the most striking accent. What can we learn from this rustic design? If you’re looking for a popping accent, use vintage weathered paint. A proper painting technique can inspire great decor. In this example, we can see how weathered paint look works to create a cozy, rustic look. What can you pick up from this picture? 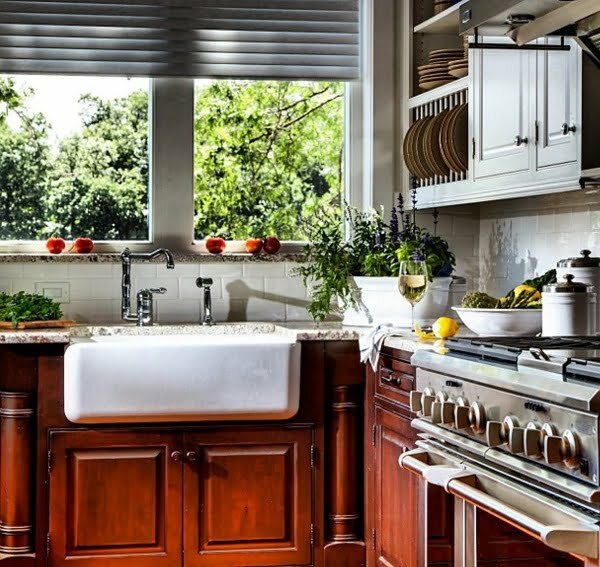 Even white cabinets can create a rustic accent in your kitchen decor. The pantry doesn’t take much space in the kitchen. That makes it a great way to create a rustic accent. 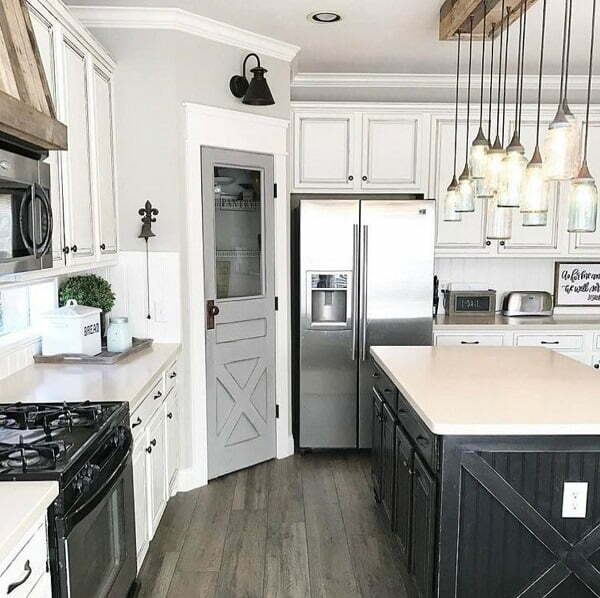 In this example, we can see how this technique works in a farmhouse style kitchen decor. The wooden finish of the pantry complements all white kitchen cabinets. You can take this technique to your home by making an accent cabinet. You can make your rustic kitchen cabinets the DIY way. And what a look you can get! It all comes down to the paint job. 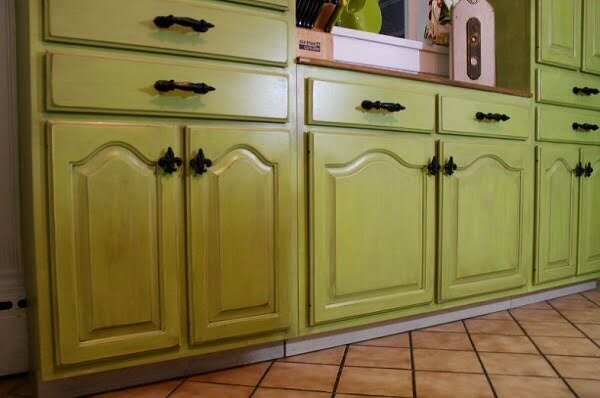 There are many ways to do it, but the right painting technique can transform any old cabinets into a rustic look. Most importantly, it’s the least expensive way to get rustic kitchen cabinets in the first place. And you can be proud of your work. Mixing stained and painted cabinets is a great way to get the contrast that puts an accent on rustic style. It’s the mix and match technique that is so popular in modern interior design. You can achieve this look by combining regular cabinets with handcrafted ones. Whether you build your rustic stained cabinets yourself (or paint them), or you get a master to do it, the result is all that matters. This lakeside house kitchen is a true inspiration. Do you need an inexpensive and quick way to get rustic cabinets? Painting your old cabinets is a great way to add some farmhouse charm to your kitchen. And here’s the color of the year for rustic kitchen cabinets. Shades of green do so well in farmhouse kitchens as they naturally complement rustic accents. The earthy tones play well with warm greens or pastel colors. This is an excellent example of green kitchen cabinets done right. 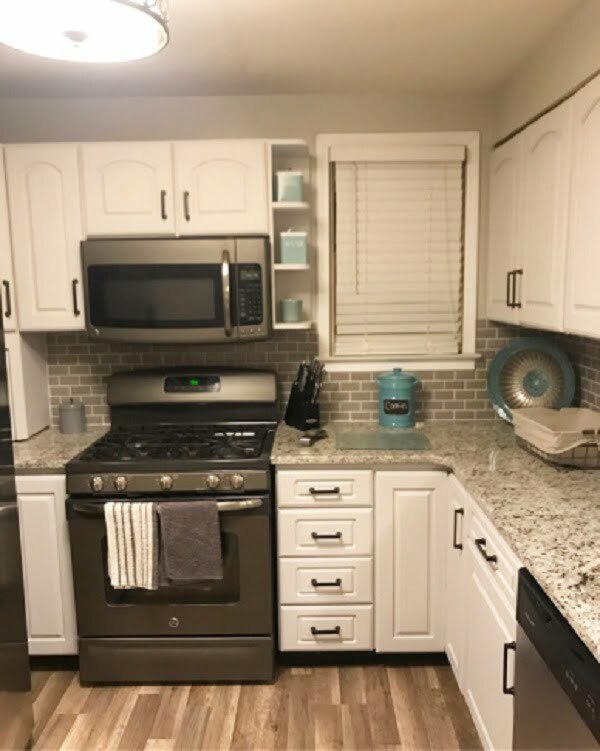 Take a look at these before and after pictures of the kitchen cabinets. It’s amazing what a simple paint job can do. Well, it’s not so much simple as using the right technique. Weathered paint look will always add so much charm to kitchen decor. If you want this rustic farmhouse kitchen at home, you’ll need to master the technique. You can practice on your old furniture until you get it right. From our experience, it’s all about practice and experimentation. 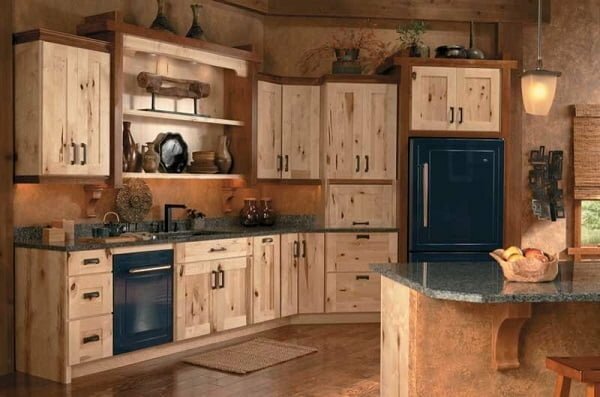 Here’s another DIY project to create your rustic kitchen cabinets. This time they are classic white. Nonetheless, the design of cabinet doors creates that old school vintage look. It works so well when you’re going for the rustic decor. 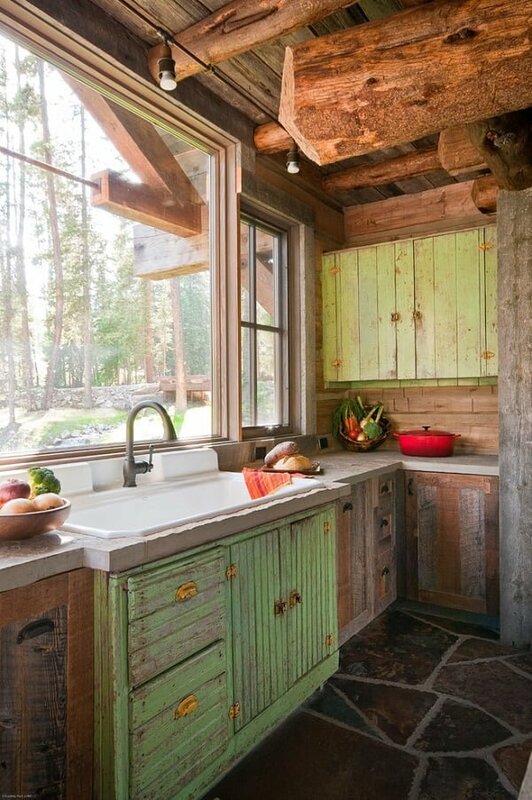 Check out this post for inspiration and tips on how to paint your rustic cabinets. Here’s a look for magazine covers. Combining natural wood cabinets and storage shelves made from crates is a great way to achieve the rustic look. It’s an inexpensive way to do it too. Better yet, you can use wooden crates for shelving with many types of cabinets. This creates contrast and accentuates the rustic elements that you want. When you’re using multiple rustic accents in your kitchen decor, they have to work together. In this case, it’s the pastel green cabinets and open shelving made of solid oak. 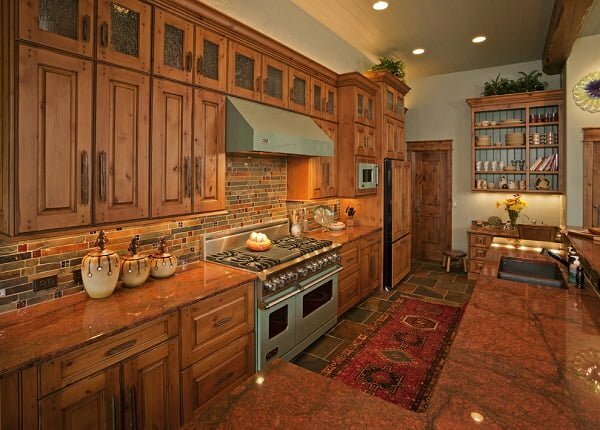 Together with butcher wood countertops, they create a complete rustic look. We love the modern meets traditional look in this kitchen design. The rustic accents bring it all together nicely. Natural wood will always work in kitchen decor, so don’t shy away from this texture. The whole ensemble is cozy yet modern. The sharp lines of the contemporary design are hidden away by the earthy rustic accents. This kitchen design is inspired by hardwood. It all begins with the floor in this picture. 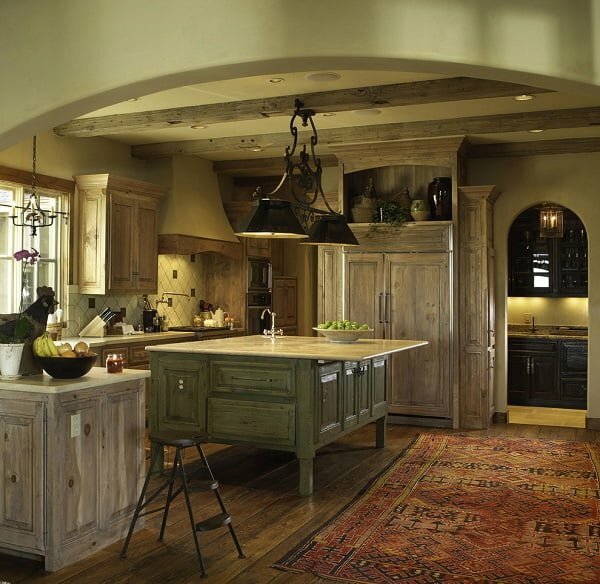 The cabinets and the furniture only extend the rustic look. If you’re looking for a complete rustic look, this is it. There’s everything to create a deep sense of comfortable rural lifestyle in this picture. 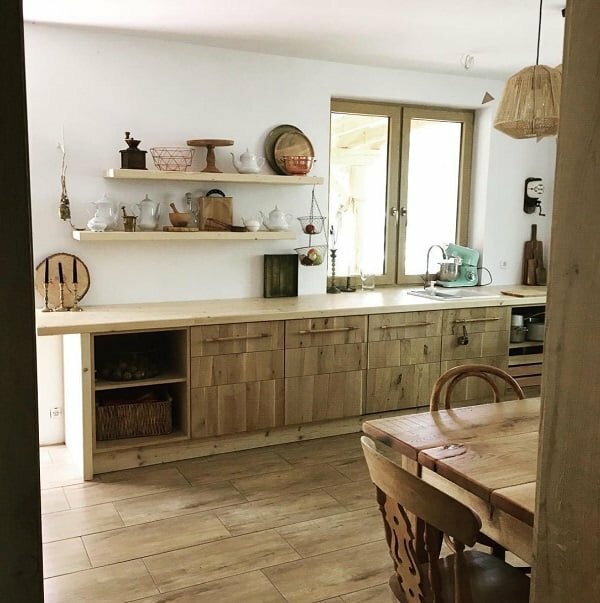 Here we can see the classic attempt to create a farmhouse kitchen. And it succeeds in doing that. Everything from the choice of color to the furniture and decor accents come together to create an Instagram-worthy look. What inspires us most in this design, is the contrast between the white and black cabinets. Both of them work consistently to provide rustic accents that are much needed. 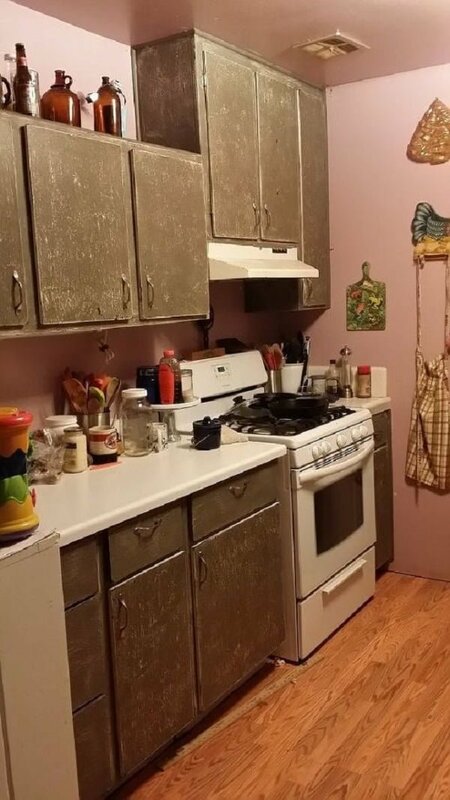 The cabinet styles in this kitchen are all over the place. We can see simple teal cabinet doors, barn wood doors, rustic drawers, and a solid wood kitchen island. And you know what? It all works nicely to create a cozy, rustic look. Now, we’re not saying you should try to replicate this design (it’s quite complicated). But you sure can get some inspiration for decor accents through your kitchen cabinets. 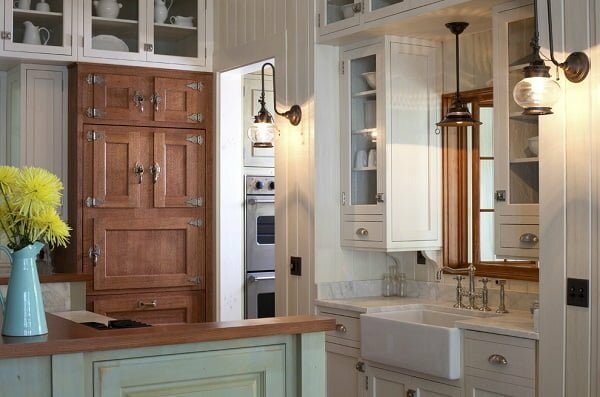 When everything else fails, you can always turn to vintage shaker cabinets for an instant uplift in rustic style. These cabinets can be a striking accent in any decor. And this picture is proof of that. 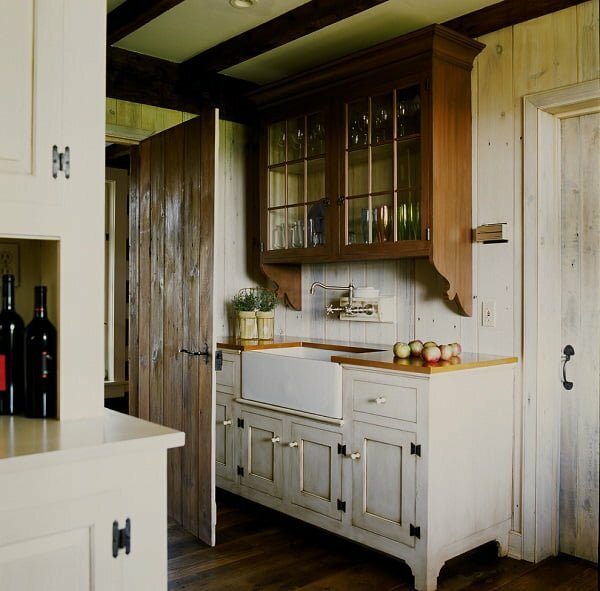 So much so, that even simple shaker cabinets can be the basis of beautiful rustic decor vignettes.